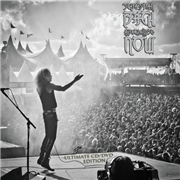 SEBASTIAN BACH still has two abilities, to sing and to keep the frontline females screaming. Recorded live in both France and the US these two gigs shows a front man in fine shape and a band consisting of guitarists Nick Sterling and Johnny Chromatic, bassist Jason Rappise and drummer extraordinaire Bobby Jarzombek. Whether the concert is European or American the foundation of the material is from the glory days about 25 years ago. I´m not saying that the new material is poor, it´s just not as well known, how could it compare? To his credit Sebastian gives just about everything a modern overhaul. By modern I mean an injection of sleazy heaviness. “Piece of Me”, “Monkey Business” and “Youth Gone Wild” are really wild at heart, and are released here. “Big Guns” (maybe) and “18 and Life” (definitely) get a respectful replay. It´s sad that there can be no reunion of the original SKID ROW, but fact remains, SEBASTIAN BACH does very good on his own.